One way to check enterprise use is to measure the ratio of use of the product during weekends vs. use during weekdays. The logic being that weekend use is almost strictly consumer use and weekday use is mixed. Any normalized significant difference between the two measures should indicate a bias toward consumer use or vice versa. The following charts show the percent of each platform’s use with weekends separated from weekdays. The larger the delta the more likely the more the bias one way or the other. To that end I measured the average percent of visits from iPad (as a total of all visits) for weekends and weekdays and measured the delta between the two. On the weekend the iPad was accounting for 13.3% of visits. On weekdays it was 8.8%. A difference of about 4.5% in favor of weekend use. To calibrate that figure I did the same for iPhone, Mac and Windows use. The following chart shows this ad-hoc index of “enterprise use”. Essentially the data is inline with assumptions. The iPad is the most likely to be hired by consumers. 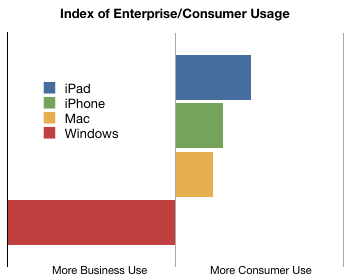 The iPhone is more than the Mac and they’re all far more likely to be consumerized than Windows. 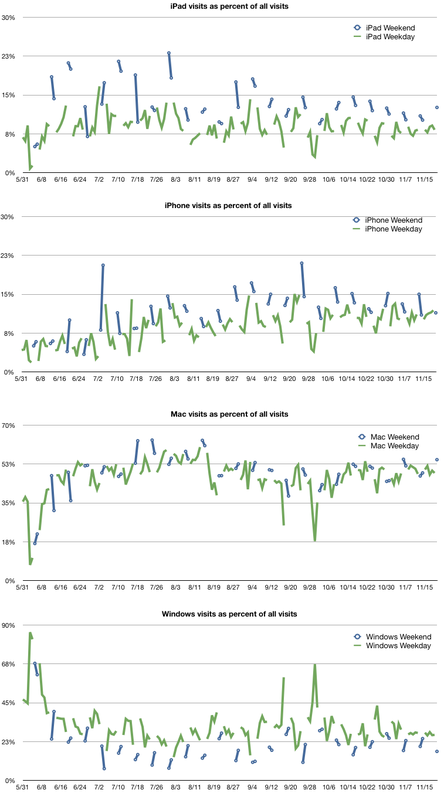 The average consumption of Asymco.com through Windows was 32% of during weekdays but only 22% during weekends. In order to make this measure more meaningful, the evolution over time of these figures should be tracked. If the Blue bar above moves more toward the center then the chances are that iPad will be more adapted by business users, or at least more in use at work. Does this seem like a valid method for measuring relative enterprise use?